After Apple introduced widgets on iOS devices, this has become one simple way to get access to apps on the go. The best iOS widgets can assist users to preview the app in a small interface or window without bothering to run them actually. Users can make use of widgets for a few inbuilt apps. However, it is not realistic for you to download all apps from App Store to judge whether a widget is helpful. This guidance can make it easier for you to identify widgets and instruct you to use them properly. Nowadays, to use a widget on iPhone has become necessary for making use of one third-party application, which can make the most of your iPhone. This technology is required by iPhone, for numerous iPhone users would like to use such useful add-ons to enable the iPhone using just like operations on a computer. Here I would like to list several best iPhone widgets 2018 to allow you to keep updated wherever you are. Day One Journal is known as one of the best iOS 11 widgets, which can help you to keep record of your daily schedules. You are able to use this widget to save images and notes quickly. It also allows you to get a widget notification for the reminders you have set. DataMan, as one of the best Notification Center widgets, can assist you to track and display your mobile data usage effectively. This widget can help you to avoid overusing your purchased data service. You can just swipe down the iPhone Notification Centre to check the data usage info by yourself with little hindrance. Fantastical 2 is a wonderful calendar app, whose widget is also perfect. It can display you clearly that how much time remains till your next appointment in the calendar. It is really one of the superior iPhone or iPad Notification Center widgets to combine calendaring and work schedule together. This widget allows you to keep track of the current temperature and conditions in time. You can also click on it to check the precipitation forecast and the outlook for the next five days, which is very proper for people who are always on business trips. Google Maps widget is more visual, and users can check the current transportation info without bothering to open the app itself. It is better than Apple Maps in several key points. ESPN widget enables users to obtain a quick updates of scores of some important matches that you have designated as your favorites. You do not have to launch ESPN app to get the latest match news. The best iPhone widgets are really attractive to you. Do you know how to add widgets iPhone and how to get rid of widgets iPhone? If you want to know the methods, this part will not let you down. The step-by-step illustrations will surely satisfy you. As for how to get or add widgets on iPhone, the following steps will direct you to make it. 1. On your iPhone, swipe to the right on home screen or pull down the Notification Center to check all your widgets. 2. Afterwards, you need to drag down to the bottom of the list of the widget to click on the “Edit” button. 3. Drag down to view the widget that you desire to add to iPhone. Hit the green icon with “+” in the middle and then click on “Done” button at the top right corner of the interface. If you become fed up with one widget or you feel it is not necessary, you can get rid of it whenever you like. 1. First, you can refer to the first 2 steps in Part 2.1 to click on “Edit” button. 2. In the next interface, you need to click on the red icon with “-” in the circle. After that, hit “Remove” button to delete the widget. The steps to add and remove widgets are really simple to master. As a matter of fact, you can also fix how to move widgets on iPhone X by hitting and holding the icon of three horizontal lines to change the order of your widgets. You may have the habit to add notes or set schedules on your calendar. However, what can you do when the calendar disappears? How can you get it back? If this is one key matter that you care about, this part of the tutorial will help you to get rid of this anxiety. 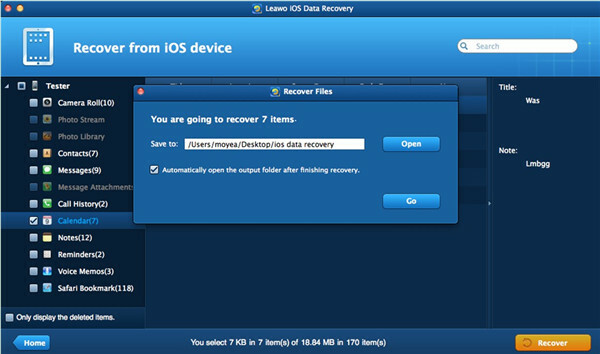 Leawo iOS Data Recovery for Mac is just the tool I would like to suggest you to make use of. Its restoration features are really amazing, for I have applied it to find my messages and calls back. It is always helpful to assist you to retrieving apps, contacts and other data on iPhone to Mac. You can read the following contents to know how to restore iPhone calendar to Mac with this excellent tool. Run the tool on Mac and then select “Recover from iOS Device”. 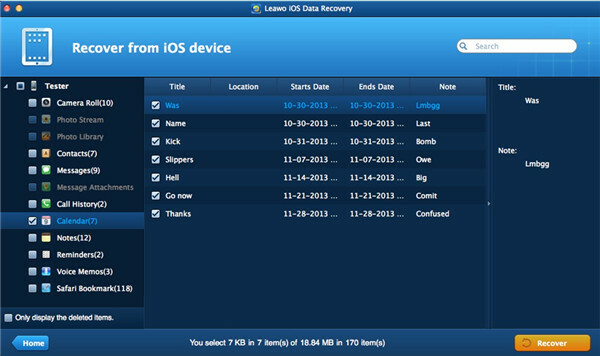 Insert iPhone into Mac and then wait for the automatic detection of Leawo iOS Data Recovery for Mac. You will see a list of files and data on the left sidebar of the interface under iPhone icon. You need to hit on the tab of “Calendar” and then choose to tick the contents in the right part of the interface that you want to restore to Mac. After that, hit “Recover” button at the bottom right of the window. In the pop-up dialog, you need to click on the button of “Open” to find a target folder to store the recovered calendar data. Hit “Go” in the panel to begin to recover calendar from iPhone to Mac folder. This process will take you several seconds. Finally, you can check the HTML file of the calendar on Mac with no efforts. 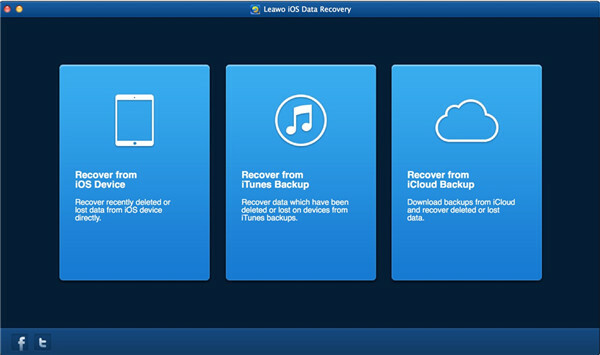 This smooth process is due to the perfect design of Leawo iOS Data Recovery for Mac. It is worth downloading and installing on Mac for a rainy day. Its good reviews from users all over the world is also one aspect to encourage me to recommend it to you.